Eyan - Modeled after an Elephant. Many African cultures revere the Elephant as a symbol of strength and power. It is also praised for its size, longevity, stamina, mental faculties, cooperative spirit, and loyalty. Made In The USA - Proudly made In Charlottesville, Virginia in the Blue Ridge mountains. Environmentally Conscious - Made from 100% Sustainable Forestry Initiative Certified, responsibly sourced recycled cardboard. 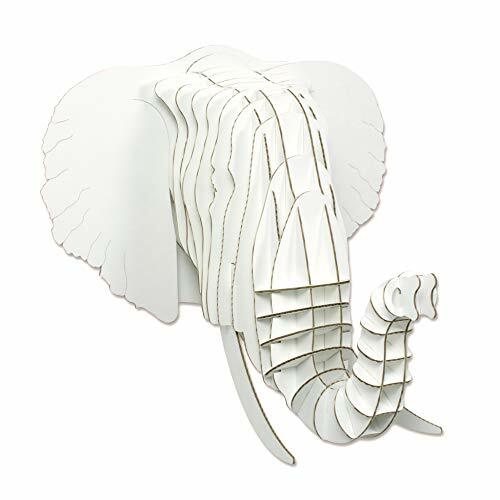 This creature not only makes for a unique home décor item but also keeps cardboard out of landfills and keeps animals in the wild where they belong. No Elephants were harmed in the making of this piece. DIY Possibilities Are Endless - Construct as is, out of the box for a simple decorative piece or you can embellish the pieces with your favorite spray paint, glitter, sequins, gems or paper for a personal touch and artistic feel. Laser Cut And Flat Packed - Makes for easy shipping and assembly using slotted construction. Detailed instructions are included with each item to aid in the process. If you have any questions about this product by Cardboard Safari, contact us by completing and submitting the form below. If you are looking for a specif part number, please include it with your message.